Every year, the Friends of SOS host the Marigold Gala; a Reception and Dinner in support of SOS Children's Villages. 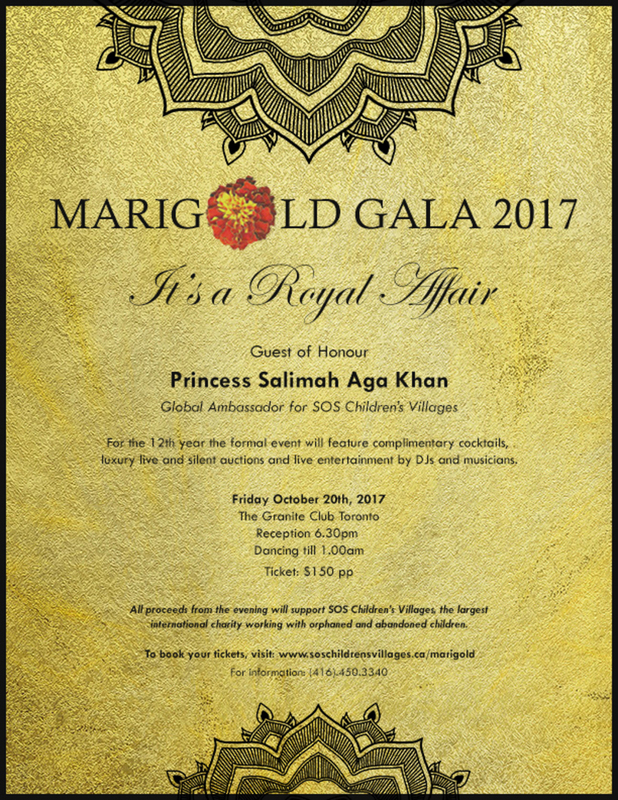 This year it is our pleasure to welcome Princess Salimah Aga Khan for a memorable evening of food, music, dancing and art. When you purchase your ticket you will receive a charitable tax receipt for 75% of the cost. This will go to support SOS Children's Villages and will support children with nutritious food, education health care and opportunities to succeed in life. It's one of the highlights of the year at the Granite Club and this year's Marigold Gala 2017 is fast approaching. The annual gala is a highlight of the fall social calendar, bringing together communities for a spectacular evening of food, special guests and entertainment. The event will feature our Guest of Honour, Princess Salimah Aga Khan, exciting silent and live auctions; music performances to be hosted by presenting sponsor (To be Announced); and an inspiring program featuring TBA. TBA will emcee the evening’s program. Turning an eye to children , the Friends of SOS is inviting you to celebrate a future where all children and youth have the support and resilience to create a lifetime of unstoppable successes.